Onkyo A-9050 review | What Hi-Fi? 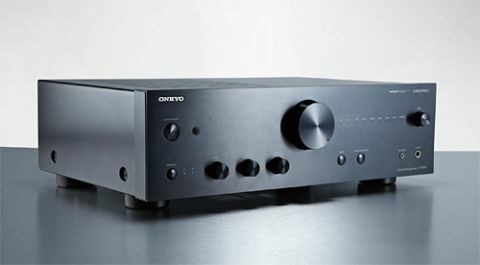 Onkyo’s new range of integrated stereo amplifiers grabbed our attention during consumer electronics show IFA 2012, the entry-level A-9030 (£250) impressing us with its lively, enthusiastic presentation. The Onkyo A-9050 is that unit’s £350 big brother, and sonically it’s a different proposition. Hi-fi kit in the same range tends to share familial traits – the sound tends to get more revealing and inherit more layers of detail as you go up the range, but the sonic character usually remains consistent. The two Onkyos, though, have gone in different directions. Where the A-9030 sounds warm and comfortable, the A-9050 has a much thinner and more brittle sound. The thin sound makes the A-9050 feel a touch anaemic compared with the more robust A-9030. Its soundstage also seems modest when put next to the likes of the Rotel RA-10 and Marantz PM6004. With a lack of weight to the overall sound, there’s a shortage of punch and richness that doesn’t fully engage the listener in the way that made the A-9030 so appealing to listen to. This aspect is most revealing when playing a turntable using the phono input – spin Dusty Springfield’s Spooky, and the sound is much less involving than some rival amplifiers, robbing songs of the usual mellow and warm glow we tend to associate with vinyl records. That said, while the Onkyo is not the smoothest and easiest listen, it’s not without its merits. The A-9050 is fairly well-balanced across the frequencies and has a decent helping of detail on board that makes you keep on listening. It may not have the layers of insight and composure that we'd really like, but its clean and assured sound and good grasp of timing does make it rather listenable. Play The Social Network soundtrack, and you’ll find that it has a more tightly controlled bass that gives it an edge over its in-house competitor, the A-9030. It has a gentle and deft touch when it comes to dynamic shifts, too, being more pliable than the stubborn-sounding Denon PMA-720AE. A step up from the A-9030 means an increased power output of 75W per channel, along with digital inputs (one optical, two coaxial) linked to an integrated Wolfson 192kH/24-bit DAC. Stream music directly from a computer, or connect to a streamer using a digital connection, and you’ll find the DAC has a similarly thin, hard sound. The A-9050 itself is a solid piece of kit and looks good finished in either silver or black. It offers plenty of connectivity with five analogue inputs alongside the aforementioned moving-magnet phono input. It also has analogue, subwoofer and headphone outputs, and two sets of speaker terminals. This Onkyo faces stiff competition from rivals. It has plenty going for it, but it needs to be more rounded to seriously worry the class leaders.